Changes or cancellations to your booking can only be accepted up to 4 weeks prior to arrival without charge. Any changes made after this, may unfortunately incur an extra charge. The balance must be paid 4 weeks prior to arrival. A full rooming list and estimated time of arrival is required at this stage also (with the room type booked for each person). On arrival a ‘code on conduct’ must be filled out by a group leader. It is company policy to charge a fully refundable damage deposit of 20.00 Euro per person. Your credit card will be “Pre – Authorized” for this or you can pay in cash on arrival. 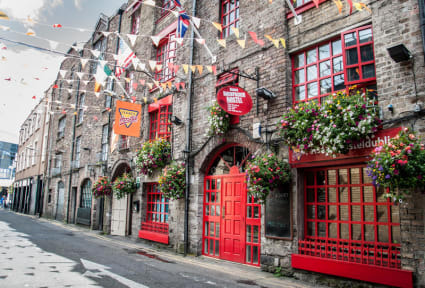 Isaacs Hostel has been with Hostelworld for more than 10 years and it's not too hard to see why; it's located very near Connolly train station and Busaras, Dublin's main bus station, providing easy connections to the rest of Ireland. It's also within walking distance of O'Connell St and Temple Bar and guests tell us it's 'a very convenient connection to the airport'. 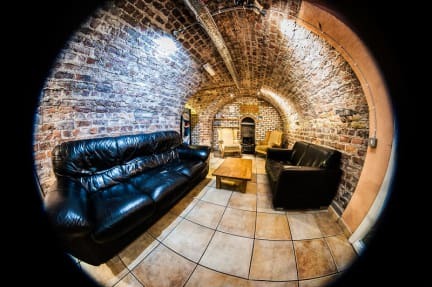 The highly recommended pub crawl is hosted by the friendly and helpful staff who ensure this hostel provides 'a cosy atmosphere and a good opportunity to meet travellers'. So why us? Isaacs is the original Dublin backpacker hostel with a really friendly and warm atmosphere, bang in the City Centre. After a hard day’s sightseeing, our chill out areas are just the job for meeting other travellers. Isaacs offers all the facilities a backpacker could want! Multi-bed dorms and private rooms available to suit your budget and you get free Wi-Fi, free breakfast, free sauna, free guided walking tours and sometimes free live music! We've also got a guest Kitchen, laundry facilities, Xbox, DVDs, a pool table, Fussball ,Table tennis and general almighty craic. Wouldn't you like to stay in the best city centre location? Well, Isaacs Hostel couldn't be more central. Outside is the direct bus from Dublin Airport; take the 747 bus and get here from airport in only 25 minutes! We're also opposite Busaras, the central bus station. It's only 200m from here to Connolly train station and 20m to the LUAS, while O'Connell St is just 500m away. It's an easy walk to the 3 stadium, Croke Park and only three DART stops from the Aviva Stadium. All tourist attractions, restaurants, bars and shops (including Trinity College and Temple Bar) are but a five-to-ten-minute stroll away. You can enjoy regular Free events running in the hostel for guests, including daily walking tour, Pizza nights, Quiz night and much more! With no curfew and 24-hour reception you can chill out in our common areas. Isaacs has the cutest common space to hang out, chat, chat up, play and party in than any other hostel around! We are a secure hostel, open 24 hours, with key card access to all our bedrooms, self-catering kitchen and atmospheric common areas. We also have a free light breakfast in the Hostel . Famous for our friendly, knowledgeable staff, you can pick up some great tips on how to make the most of your visit to Dublin from our team; they can even sell you tickets for the best tours and attractions around. Nice staff and good experience! The staff looked after me so well and made me feel so safe as a solo traveler. Can’t recommend Isaacs hostel enough! The private room was absolutely perfect for a neuroscience conference on a budget where sleep was necessary! Everything was clean, staff were helpful jokers, great atmosphere. Only niggle was that someone came in to clean my room without letting me know, it's standard practise and I had all my valuables with me, but a heads-up would've been nice. Only stayed one night but it was a good one. The hostel seems to have good atmosphere. I would have love to join either the pub crawl or the city tour but my schedule didn't let me. Staff was nice, very supportive. I would have liked a better breakfast, but considering the price of the bed which includes breakfast, it was fair enough. We had a trip up in our reservation where our payment at check-in wasn't complete, so they forced us to move rooms in the middle of the weekend. Also, there is a 3-night minimum that we were not aware of so keep that in mind when booking. Otherwise, there were 2 really nice guys at the reception that helped us out when we first got there and they had a lot of opportunities for everyone to do. Decent value for the money. Clean, but a little outdated accommodations. I would stay again due to its convenient location next to the airport shuttle bus.